Back in 2003, I enjoyed a memorable two-hour telephone interview with Hall of Fame songwriter, John D. Loudermilk. Loudermilk told me he was born on a kitchen table at 8th & C streets in West Durham (today that's Iredell and Knox, near Magnolia Grill). Loudermilk also told me 'Marven's Alley' in East Durham was the inspiration for his hit song, "Tobacco Road' (see lyrics below). The Walgreen's across from the downtown Kress Store was the inspiration for Loudermilk's hit song 'A Rose and a Baby Ruth.' Loudermilk told me he always stopped at Walgreens to pick up a candy bar for his girlfriend in East Durham, and they were having a sale on flowers. So, he bought her a rose and a Baby Ruth and the rest... is history. Carden's Dance Hall was on Highway 70/West (near 751). This hall was the first place Loudermilk performed on stage. He called it 'a rough place' (It's still standing, behind the old Libby's Too restaurant). Loudermilk knew Don Schlitz ('a good friend of mine who was born two doors away'). Schlitz, whose mother grew up in a two-story mill house on Ninth Street, wrote 'The Gambler' (recorded by Kenny Rogers). Loudermilk will be featured in the upcoming film, "Durham: a self-portrait" (Nov 16 at 7PM in the Carolina Theater). He was interviewed by director, Steve Channing, as he sat in a chair next to the Erwin Cotton Mills in Old West Durham. After the interview, we drove to his birth place a couple blocks away, stopped at a house where he lived as a kid on Dezern, and past many of the landmarks mentioned above -- culminating with Morven's Mill and "Tobacco Road." This country song was written by Loudermilk in 1962, and became a #5 hit for the Nashville Teens in 1964 during the peak of the civil rights movement in America. 'Tobacco Road' was also performed by Lou Rawls, David Lee Roth, and Edgar Winter. Very interesting story and pictures - thanks a lot. One tiny correction in John Schelp's reaction: Tobacco Road was written in 1960, not 1962. 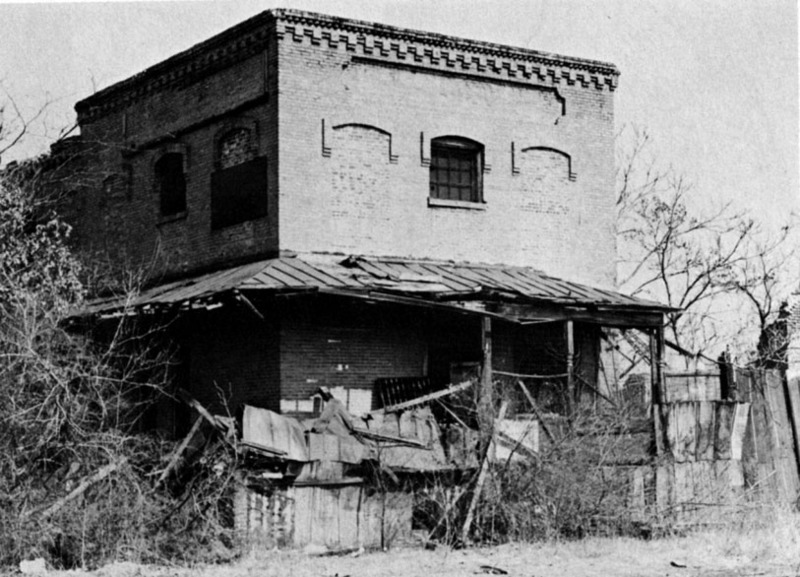 The buildings that would become the Commonwealth Cotton Mill were built in 1884 as the Durham Bobbin and Shuttle Mill - a supplier of wooden parts for other cotton and wool mills - by John C. Angier, Alvis H. Stokes, Samuel T. Morgan, Eugene Morehead, James Blacknall, and Julian Carr. Richard Wright and Dr. J.L. Warkins purchased the factory in 1888 installed a mansard roof. The business did not thrive, and Wright sold it in 1891 to a Rhode Island firm that came in, "dismantled it" and carried off the machinery. The buidlings were repurposed as a textile mill. 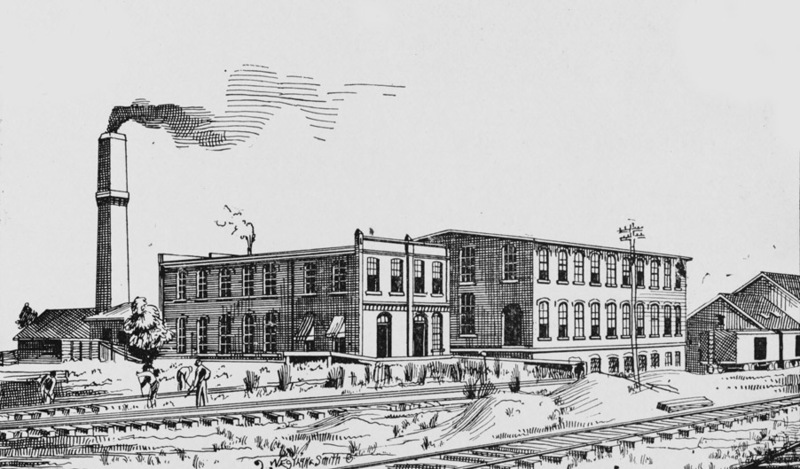 According to the Architectural Inventory, the plant appears to have begun producing textiles prior to 1891, with majority ownership by Carr and Wright. (I'm not sure how the transition from the Rhode Island Co. "dismantling" to this ownership occurred. However, the mill was not very successful at the outset, and Brodie Duke bought out Carr and Wright for less than the face value of their shares in 1892. By 1895, the mill employed 140 people. Brodie Duke had declared bankruptcy in the Panic of 1893, and Ben Duke took over controlling interest in the company. He spent $30,000 enlarging the complex and added a 4 story tower to the building; quite similar to that at the Pearl Cotton Mill. The business was, per Ben Duke, quite successful. 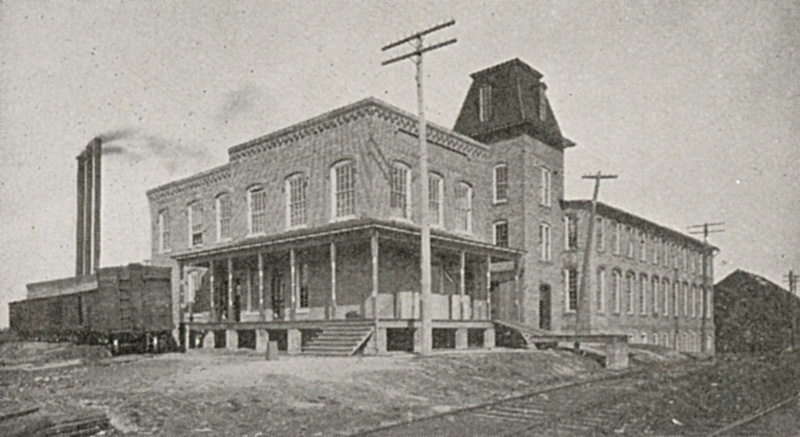 An expanded office building on the west side of the complex was built around 1900. 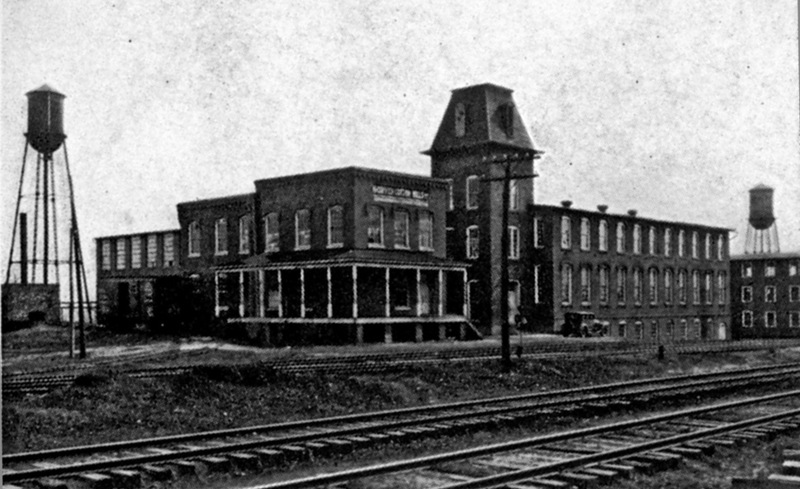 Commonwealth Cotton Company, looking northeast from the railroad tracks, 1906. While the company was evidently still quite successful in 1910, it ceased operations in 1913 - for reasons unknown. In 1922, the complex was taken over by the Morven Cotton Mills Company. The Morven Cotton Mill proved as star-crossed as the previous ventures, closing by the 1930s. 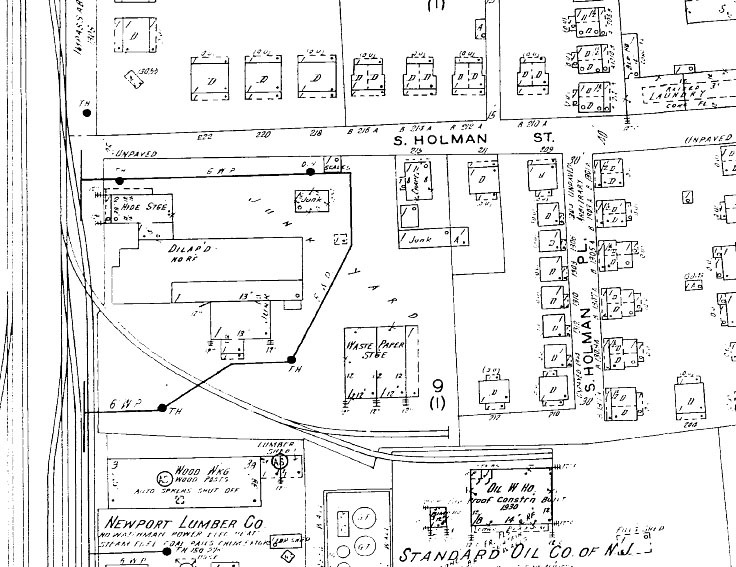 The 1937 Sanborn Maps indicate an abandoned structure and a site used as a junkyard. John Schelp related the story to me told by John Loudermilk - that he used to have to make deliveries to Holman Place, later Morven's Alley, directly to the north of the complex. Evidently the street and houses were company owned (a common practice for the textile mills) and the place was a den of iniquity - one the police did not come to. This, evidently, was the inspiration for the song "Tobacco Road." The fascinating thing about this complex of structures is that, well, nothing happened to it. It just continued to slowly decay over decades of non-use. By the 1970s, the tower had collapsed, and the main building was in ruins. The office building was still realtively intact. Commonwealth / Morvern Mills, 1970s. Today, there is little trace of the original mill complex. Looking north from the railroad tracks, near Pettigrew and Alston, 2007. Remnants of the main building, 2007. I have to say that I have always loved ruins - probably explains a lot. But the fact that these are hidden in the trees is sort of magical to me. The area immediately to the north of this is still a junkyard of sorts - hard to tell whether it's a junkyard, or just a big pile of stuff people have thrown here.